In effort to compete with Sabjimata Mata and Kurma Prabhu delicious prasadam blogs I hearby submit our twelve month sandwich. There are five main cooks who are always involved. The first one is Gaurachandra and on His right side stands Nitaichand and His left side stands Gadadhara. Nearby cooking is Advaita and Srinivas is holding the spatula. Sweet Mrdanga sauce is mixed in with spicy kartals accompanied with side orders of conch and bells. All the demigods headed by Lord Brahma line up to get an opportunity to relish this sandwich. In fact the flavor of this sandwich conquers the flavor of millions upon millions of curd sabjis. Lord Shiva, Sukadeva Goswami, and Narada Muni are all there and are choked in ecstacy to get but just a taste. This sandwich is what we have had the pleasure to honor for the past twelve months. 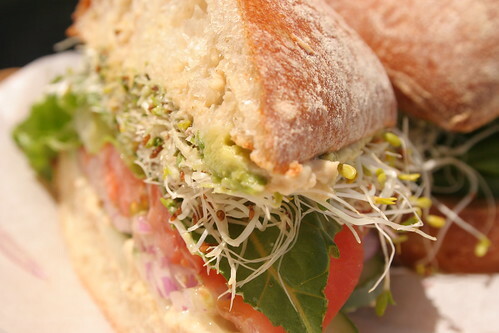 The ISKCON sandwich. During Srila Prabhupada's time he established a program of spiritual purification by which one can make steady progress in Krishna Consciousness. It was nicknamed the ISKCON sandwich, a Krishna Conscious Program of bhajan, kirtan, artik and class every morning and every evening. Many devotees eager to rapidly expand Krishna Consciousness asked Srila Prabhupada if it were ok to miss the evening program in the event of late evening book distribution and other such outreach functions. However when such late activities were decreased also the habit of returning back to regular programs in the evening waned. Instead of live chanting during the Gaura Artik more often it would be found that there was simply a tape playing. This one slice sandwich was not enough to fill up the spiritual staved soul therefore the devotees decided to return to the healthy diet of the double slice, Mangal mustard, Gaura Artik greens and a class ever few days for proper nutrition. * for an actual translation of the Gaura Artik song click here. govindah--Lord Govinda; sarva-karana-karanam--the cause of all causes. is the prime cause of all causes. I see a newer version of the Gaura Aarti!Wow, this is truly beautiful.Wonderful job! !Hope all of us get a taste of that nectar Sandwich and just get a glimpse of that sublime truth of Harinam Sankirtan!